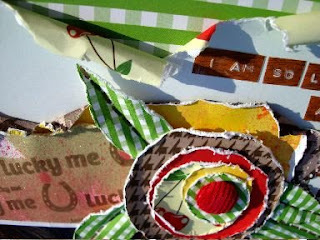 I got my goodies from Nikki Sivils, Scrapbooker on Friday and I must say that they are delish! I finished one page already and working on many more... Here's the line I worked with for this layout... Sweet as Cherry Pie. Isn't it sweet??!!! 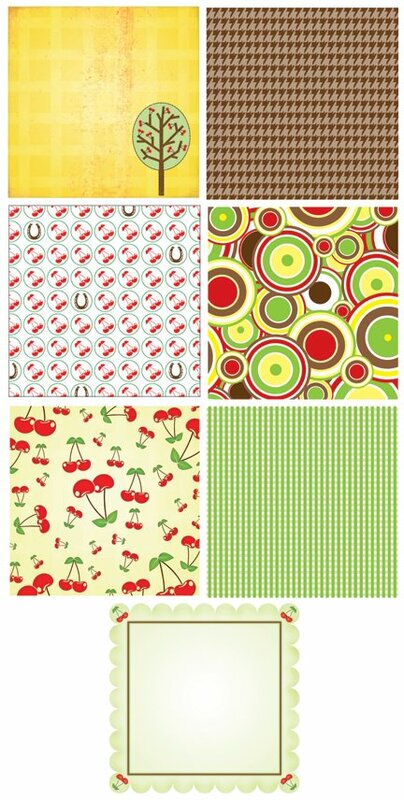 I love the graphics and the bold colors together... modern and retro in one! Look for her at CHA this July! She has 6 lines total coming out there. I have seen 3 of them and can't wait to see more! I used the papers from the mini 6 x 6 pad to create the flowers and stamped the cute sayings and horseshoe to create a text paper with glimmer mist to add color. The brads are her's too and they are covered with cord! It's gorgeous! I love all the designs! Detail of the flower and "stamped text paper"
Off to scrap some more before I have to go to school and finish packing my room up. What a pain! I have over half done (took me 5 hours to do that) and haven't even finished yet! I am getting anxious to just be moved already so I can start setting up my new room, but of course, the school year isn't even over yet... this is the last week. I'm sure Diane (who is the retiring teacher) is still going through things and packing up her stuff too. I am just getting ahead of myself. It's officially summer and Mark is chomping at the bit to get in Nonna and Grandpa Bob's pool... He would LIVE in the water if I let him. He's a little fish and the happiest when he's swimming! Lots of good photo ops there though. Can't wait to see little Christopher in the water soon! We will attempt to do that tomorrow I think. It's gonna get HOT this week and I'm sure a dip in the pool is exactly what we need. 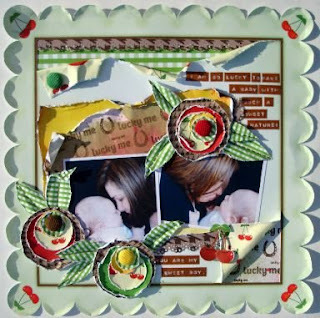 I'll post this week with my new Black River Designs projects.. Again... YUMMY stuff. I am lucky to have the opportunity to work for 2 great companies! love those yummy pps! great work Jen! Wow, this is gorgeous! I can't wait to get my box! i like i like...is really nice!